If you’re looking to get into a spending war with someone, Sheldon Adelson would seem to be one of the worst opponents you could pick. Not only is Adelson outrageously wealthy, but he’s proven in the past that he’s willing to spend whatever we feels is necessary in an attempt to get his way. That’s why it’s shocking when you read that Adelson isn’t just getting outspent in an arena, but is getting outspent many times over. And that’s exactly what’s happening right now when it comes to lobbying efforts related to Adelson’s crusade to stop Internet gaming in America. That effort, which includes online poker, has led to $460,000 in lobbyist spending by the Las Vegas Sands over the first six months of 2014. That’s a big expenditure in this regard for the company, and is just $10,000 less than the most the company has ever spent on lobbyists in a previous calendar year (2008). On the other hand, that number starts to look awfully small when compared to what is being spent on the other side of the argument. Caesars and other companies have a vested interest in seeing online poker flourish in America, and they’re pulling their weight to make sure that happens, or at least to prevent the outright ban that Adelson is looking for. Caesars Entertainment led the way in lobbying related to online gambling, having spent nearly $1.8 million so far in 2014. MGM has also been active, spending $240,000 on lobbyists, while Boyd Gaming has spent $230,000 and Churchill Downs another $100,000 in the last quarter. Add up those numbers and you’ll find that the pro-Internet poker is outspending the Sands by a 5-1 margin. Those are the kinds of numbers that might make one wonder how Adelson has managed to wage a strong campaign against online poker in the face of such overwhelming opposition. The answer, of course, is that these numbers only tell a very small part of the story when it comes to the battle over Internet poker. The numbers, which are based on information found from OpenSecrets.org (a website that tracks publically available data on campaign contributions and other political spending), are only a look at the amount these companies are spending on registered Washington, D.C. lobbyists. That leaves out a large percentage of the spending being done by both sides. Advertising and PR efforts are underway from both the Coalition to Stop Internet Gambling and the industry’s Coatlition for Consumer and Online Protection, which opposes Adelson’s efforts. There’s also the personal contributions that are being made to political candidates and current members of Congress, operations at the state level, or many other ways in which Adelson, Caesars or other entities might be spending money to influence policy and public opinion. 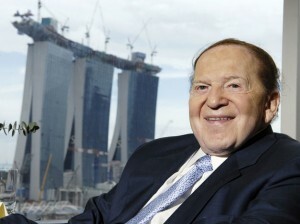 That means that it’s all but certain that Adelson is spending a lot more of his estimated $37 billion in net worth on his crusade to stop Internet poker and casino games from spreading across the United States. Adelson has previously been quoted as saying that he’ll spend “whatever it takes” to stop online gambling, and while he might not have meant that literally, it’s certainly true that he’s willing to spend big in an attempt to get his way. Adelson and his wife, Mariam, reportedly spent $92 million during the 2012 election cycle, most of which went towards supporting Republican presidential nominee Mitt Romney; an effort which obviously did not pay off.